This guide is to give you the offensive and defensive stats on all your Modules/Powers for easier comparison, as well as go into detail about what these stats mean and how they’re used in game. If you have an attack with 20%, a hit with it will steal 20% of the target’s points. While if the target is wearing a defensive module worth 30%, they’ll keep 30% of the points they would have lost otherwise. But what happens when you wear two defensive modules? What we want to focus on is how both defense values interact. And one full attack minus 30% of course equals only 70% of the attack. But when you multiply both of those, you lessen the attack even further. Gone are the days where your defense was just an average of both your powers. Now, both defense values will effectively stack; furthering how much defense you actually have. Why game is so much pay to win? Why strong fields also steal most points, while weak fields are 100% useless? Quick info about "steals" and "protects"
Huh, all fevers/mines/tap weapons have the same defense at the same level. I’m just going to move this down to a comment, as it’s not really professional of me to leave it in the guide itself. I have both of these modules at power level 6 (Rare3 + 3 vs Epic6), and the difference in damage isn’t even close. The dual shot is half of what the multi shot is capable of, yet is significantly weaker? This is probably the most glaring balancing issue at this moment. The modules are also balanced on how hard it is to hit someone. Multi-shot is harder to aim then double shot and there fewer successful hits when using multi-shot. Because of this, the multi-shot reward (attack) for hitting someone is higher. Multi-shot is harder to aim then double shot and there fewer successful hits when using multi-shot. You have to keep in mind that dual shot used to be unlocked a lot sooner than multi shot; and as a result, people got used to dual shot’s angles, and as a result caused issues once they tried multi shot. For me though, since I never really focused on using missile-based weapons, multi shot has been significantly easier to aim because the 45 degree angle in my mind makes more sense than whatever dual shot’s angle is. Also to keep in mind, you are in a safer attacking position using multi shot because you can turn away and put a wall between you and your opponents sooner. Like one shot is more of a risk to use than side shot because you’d need to make a complete U-turn to avoid being shot back at vs a 90 degree turn. Same concept applies with multi shot, especially with the backwards-aiming bullets. 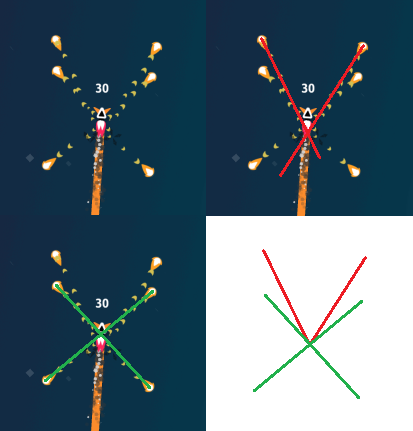 Even went in game to compare the two; first tracing the fire trails, then stacking the intersections of the two. This is really worth a 100+ point difference? I tried it with side shot and its just luck based. That’s only because you haven’t gotten used to it. It fires 4 times as many fireballs as One Shot and deals over 50% more damage per fireball. All fevers: 214 / 236 Attack, 2144 Defense. Mine: 150 Attack, 2144 Defense. It takes time to get good at aiming it, just like all the other fireball modules. It just entered the meta, so most players don’t have much experience with it. That still doesn’t change the fact that it’s ridiculously overpowered. First example. This was the first time I used multi this update. It’s never been a module I practiced - I just chose it for a random crate game. Second example. We got Owl believing he has claimed the record for most points stolen in the 3rd round. Now, aiming multi he says is tricky for him, but he has always been a dual shot or other more straight forward weapon user. But he has been practicing and the results speak for themselves. More of his practice at work. This one is pre-update; but imagine the power of it now if he actually practices it. And an edit to add one more example; from a top-20 GM’s perspective. One final edit: if you keep up with “Wall of Glory” and “Pro Compilation” threads, you’ll be seeing as more and more multi shot posts pop up. Two posted just shortly before this edit. It’s still the highest damage module/power in the game, but it’s at least not as ridiculously over-powered as it was prior. So, this one thing has been bugging me for a bit now. It’s been pretty well documented by now that weapons’ damage values are being nerfed/buffed based on their hit-to-miss ratios. Scatter shot is one of those weapons, due to its short range, that you don’t fire nearly as often as other weapons; if anything, you only fire it when you’re sure you’re going to get a hit. Because of this, it has a high hit-to-miss ratio and got nerfed heavily as a result. The way weapons are being balanced just doesn’t make sense to me right now. Maybe some of you guys can help explain this one to me? Just wanted to ask, if there is another balancing update coming in the near future. Most of the modules are pretty balanced rn. But there r a few things i dont get. Why do fevers have different attack stats? Mines r balanced pretty well rn. Scatter is a lil weak compared to other modules (fevers, shots, yea even mines) especially cause u need to get really close and u get revenge killed most of the time, losing more points u actually got. To answer your question about different attack valued fevers; I believe they’re split into different tiers based on how likely the fever’s affect is to kill you. Shout outs to any dev that would like to correct me if I’m wrong about this and/or add on to the explanations. Bottom tier: Steer-less, Speedy, Reverse. These alter your ability to control your ship, and have a high probability of killing you as a result, so they have the weakest attack values. Mid Tier: Thick, Lo/Rez, Trippy, Curve-blind. These leave you in perfect control of your ship, but alter something else that may lead to a crash. I agree with you about scatter: it’s much harder and more dangerous to use than any fever (but it has comparable numbers), it should have a power comparable to zap. Fevers are well balanced except “curve-blind”: it’s useless, because you always still see all the lines. I don’t even see people using it and I don’t remember myself dying because of that. How about making lines completely invisible, but for a less time: 1-2s maybe? I think defensive modules should have much stronger defence. I mean that shots/fevers have about the same defence as jump, brake etc. but you can also steal points with it. So according to numbers you don’t support people to use or upgrade it then (or only silvers who have 4-5 modules). yes, there will be a balance update in the near future, which I personally am very excited about, as it will be the first time we balance the game on good stats. (we measure survivability, points earned and points lost) Expect to see some surprises!